Urease is a virulence factor that plays a role in the resistance of Brucella to low pH conditions, both in vivo and in vitro. Brucella contains two separate urease gene clusters, ure1 and ure2. Although only ure1 codes for an active urease, ure2 is also transcribed, but its contribution to Brucella biology is unknown. 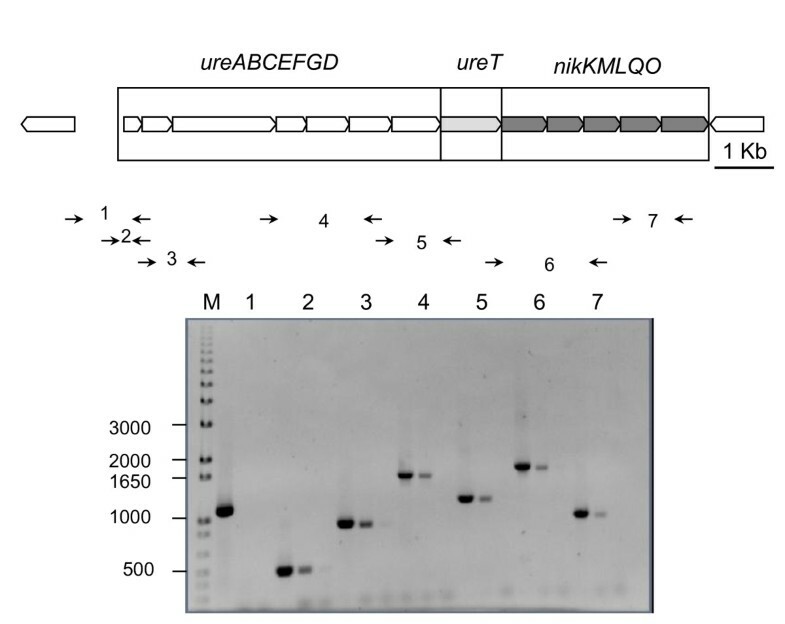 Re-examination of the ure2 locus showed that the operon includes five genes downstream of ureABCEFGDT that are orthologs to a nikKMLQO cluster encoding an ECF-type transport system for nickel. ureT and nikO mutants were constructed and analyzed for urease activity and acid resistance. A non-polar ureT mutant was unaffected in urease activity at neutral pH but showed a significantly decreased activity at acidic pH. It also showed a decreased survival rate to pH 2 at low concentration of urea when compared to the wild type. The nikO mutant had decreased urease activity and acid resistance at all urea concentrations tested, and this phenotype could be reverted by the addition of nickel to the growth medium. Based on these results, we concluded that the operon ure2 codes for an acid-activated urea transporter and a nickel transporter necessary for the maximal activity of the urease whose structural subunits are encoded exclusively by the genes in the ure1 operon. Urease catalyzes the chemical hydrolysis of the urea molecule into CO2 and ammonia. These equilibrate in water causing a rise of the pH of the medium. Accordingly, bacterial ureases serve two main purposes: to neutralize acidic conditions, and to provide a source of assimilable nitrogen. Pathogenic bacteria exploit urease activity in different ways along the infectious process. In Brucella spp, as well as in Helicobacter pylori, Klebsiella and Yersinia, urease allows bacteria to survive the acidic conditions encountered in the stomach during the gastrointestinal infection [1–5]. The role of bacterial ureases in infectious disease has been recently reviewed . Ureases are complex enzymes generally composed of three structural subunits (UreABC). To assemble a functional urease, the cooperation of several accessory proteins is required (UreEFGD) and, as a consequence, large gene clusters are needed to encode for functional ureases. Brucella contains two urease operons, both located in chromosome I. The Brucella ure1 operon contains the genes ureDABCEFG, and the Brucella ure2 locus shows the structure ureABCEFGDT . The last gene of ure2, ureT, encodes a putative urea transporter homologous to Yut from Yersinia pseudotuberculosis . Most Brucella species show a strong urease activity, derived from ure1 but not from ure2, and this activity is responsible for the ability of Brucella to survive stomachal transit and to establish a systemic infection [1, 2]. B. ovis is not able to infect the host by the gastrointestinal route, a fact that has been linked to its lack of urease activity . Furthermore, purification and characterization of urease from B. suis showed the presence of urease subunits from ure1 but not from ure2 . Strikingly, ure2 genes are transcribed in vivo [1, 2], suggesting that they play a role in Brucella. Urease is one of the few enzymes known to contain nickel atoms in their active centers . Because of this, the bacteria needs nickel uptake systems and a mechanism to incorporate the metal into the active center of the enzymes. Transition metal atoms are toxic and they cannot be free in the bacterial cytoplasm. Nickel should be delivered from the transport systems to chaperones that store the metal until needed for assembly. Chaperones and folding-assisting proteins are encoded by the urease accessory genes ureDEFG that form part of both Brucella urease operons. High affinity nickel transport systems of bacteria fall into several categories: the ATP-binding cassette (ABC) systems represented by NikABCDE of E. coli , the newly described Energy-Coupling Factor (ECF) transporters like NikMNQO  and secondary transporters from different families that include NiCoT , UreH , and HupE/UreJ [14, 15]. The ECF transporter NickMNQO consist of substrate-specific module (S components, NikMN), which are integral membrane proteins, and an energy-coupling module that contains an ATPase typical of the ATP binding cassette (ABC) superfamily (A component, NikO) and a characteristic transmembrane protein (T component, NikQ). It may contain additional components like NikL, which is an integral membrane protein, or NikK, a periplasmic protein [12, 16]. In Brucella suis, a nickel ABC transporter coded by the nikABCDE gene cluster has been identified. This gene cluster has been shown to contribute towards the urease activity of the bacteria when Ni ions are chelated with EDTA in the growth medium, but not in control media without EDTA. This implies, as noted by the authors, that there is at least another functional nickel transport system in this bacteria . Urease activity is also dependent on the supply of urea. There are at least three urea uptake systems in bacteria. The ABC-type urea transporter is energy-dependent and requires ATP to transport urea across the cytoplasmic membrane. The other two urea transporters, Yut and UreI, are energy-independent and appear to be channel-like structures that allow urea to enter the cytoplasm through a pore powered by a favorable concentration gradient that is maintained by rapid hydrolysis of the incoming urea by intrabacterial ureases. The recent determination of the crystal structure of the Desulfovibrio vulgaris urea transporter  confirms the existence of an unoccluded channel for urea, with a 'molecular coin-slot' mechanism that allows urea to pass through the transporter in preference to other small molecules. This selective filter consists of two hydrophobic slots in series, just wide enough to permit the coin-shaped urea molecule to enter. Each slot is formed by two phenylalanine amino-acid residues, an "oxygen ladder" lying along one side of the slot, and several hydrophobic phenylalanine and leucine residues lining the pore opposite to each of the oxygen ladders. The oxygen ladder provides electrostatic interactions for the urea molecules, helping to extract them from the aqueous environment outside the channel. The urea channels are composed of different numbers of membrane-spanning helices (six for Helicobacter UreI, ten for Yersinia Yut), that in the case of Yut and UreT form two repeated domains linked by a large periplasmic loop. However, the most important difference between UreI and Yut is their response to acidic pH. While Yut shows similar activity at a range of different pH , UreI shows a 6- to 10-fold activation at pH 5.0 compared to pH 7.5 . The presence of protonable residues (histidines or carboxylates) in the periplasmic loops of UreI seems to be responsible for this activation, and the mechanism of proton-gating presumably is a conformational change in the membrane domains of UreI induced by a change in the state of protonation of those residues . Both nickel and urea transport systems are required in order to reach maximum levels of urease activity. The evidence presented here shows that the urease operon ure2 includes genes for the transport of urea and nickel, and that these genes are expressed and active, contributing to urease activity and to resistance to the acidic conditions present in the oral route of infection. We have previously reported that the Brucella urease operon ure2 did not contribute to the urease activity of the bacteria . The ure2 operon of Brucella abortus 2308 was considered to be composed of eight genes ureABCEFGDT (BAB1_1376-1383). A re-evaluation of the chromosomal region suggested that some genes immediately downstream of ureT could be part of the same operon, because: 1) the distance between ureT and the contiguous gene nikM was only 26 bp, 2) there was a good ribosome binding site upstream the putative start codon of nikM, and 3) there was no obvious transcriptional terminator between the two genes. PCR amplification of reverse transcribed Brucella RNA using the pairs of primers indicated in Table 1 was conducted to assess the continuity of the transcript until we reached the first gene annotated on the opposite strand (BAB1_1389). Genomic DNA and total RNA were used as positive and negative controls, and the results are shown in Figure 1. Five additional genes (BAB1_1384-1388) were found to be cotranscribed with the first eight genes, and their functional gene annotation was performed using the SEED comparative genomics resource . The proposed role of these genes (nikKMLQO) was to code for a nickel transport system belonging to the novel ECF class of modular transporters . According to this classification, NikM would be the substrate-specific component, while NikQ and NikO would be the transmembrane and ATPase components, respectively, of the energizing module. NikK and NikL would be additional components. Their role in nickel transport is also supported by the genomic context, as urease is a nickel-containing enzyme, although we could not find other supporting evidence (e.g. NickR-binding sites in the region). The complete ure2 operon is thus composed of thirteen genes putatively involved in three different functions, namely urease production, urea transport, and nickel transport. 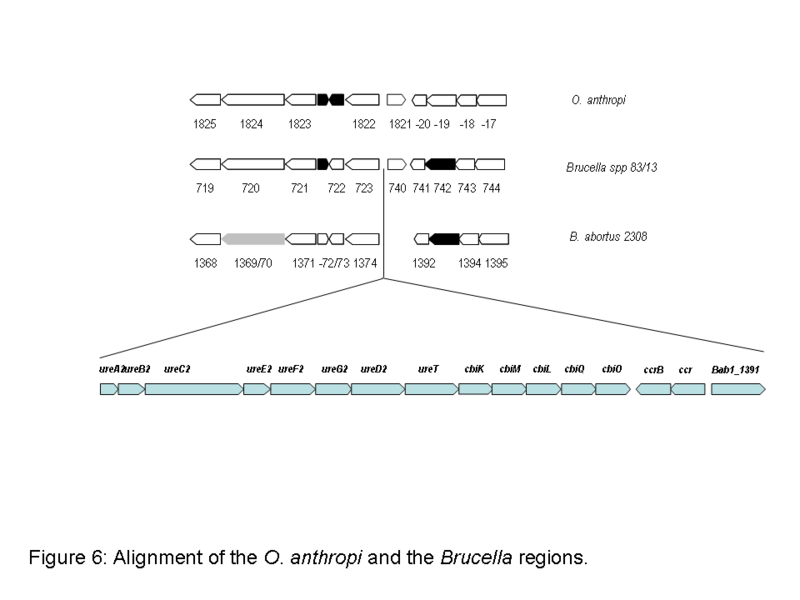 Evidence of transcription and redefinition of the ure2 operon of Brucella abortus 2308. The map on top of the figure shows the ure2 region of the large chromosome of Brucella abortus 2308. Below the map the arrows indicate primers designed to check transcription of the region. For each pair of primers marked with a number, three separate PCR reactions were performed: a positive control using genomic DNA as template; a test reaction using cDNA as template, and a control using RNA as template. M, 1 Kb Plus DNA ladder. In order to analyze the impact of the ure2 genes on urease activity, we constructed three mutants as described in the Methods section: i) a polar mutant created by replacing part of ureT with a kanamycin resistance gene that has a transcriptional termination signal (ΔureTp), ii) a non-polar mutant lacking the aph transcriptional terminator, which only affects ureT function (ΔureT), and iii) a ΔnikO mutant, affecting the ATP binding protein of the putative nickel transport system encoded by nikO, the last gene of the operon, and predicted to have the biggest impact on the correct function of the transporter while still maintaining basal activity . Urease activity was measured in crude protein extracts from the mutants and the wild type strain. 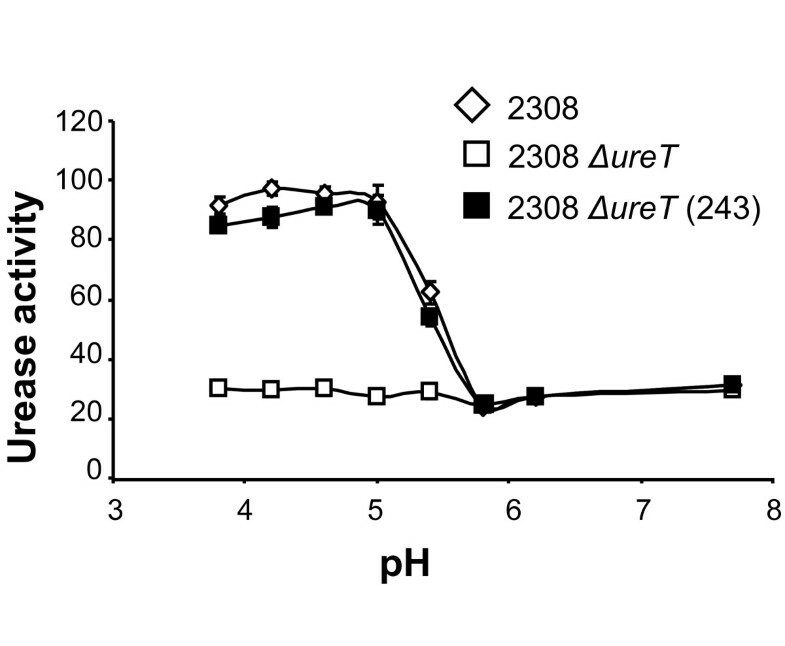 The results in Figure 2A show that extracts of both the ΔureTp and ΔnikO mutants had their urease activity reduced to about 50% of the activity observed in the wild type strain 2308, while the urease activity was rather unaffected in the ΔureT mutant. To confirm that the observed effects were direct consequence of the introduced mutations, mutants were complemented with plasmids carrying either ureT or nikO genes. Mutants ΔureTp and ΔnikO were complemented by the nikO containing plasmid pFJS245 (Figure 2A), but no effect on urease activity was observed when pFJS243 (containing ureT) was used to complement the ΔureTp, ΔureT, or ΔnikO mutants (data not shown). Urease activity of B. abortus 2308-derived strains. Urease activity was determined in bacterial extracts obtained from the indicated strains and growth conditions, and expressed in μmol of NH3 min-1 mg-1 protein The experiments were performed by triplicate with three technical measures per replica. The data shown correspond to one representative experiment and the error bar indicates the standard deviation. An unpaired t-test was performed to determine if the urease activity of each mutant was significantly different than the corresponding wild type control. A. Protein extracts from cultures of the indicated strains grown in BB. B: Protein extracts from cultures grown in BB supplemented with 0.5 mM NiCl2. * indicates p < 0.05. Nickel and cobalt are transition metals that can share the same bacterial import systems . The genes nikKMLQO, currently annotated in the Brucella genomes as components of a cobalt transport system, are found downstream of the ure2 genes, and form part of the same operon, so we tested whether they were involved in the transport of nickel, which is essential for urease activity. The addition of an excess of nickel in the form of NiCl2 would supply the metal needed for urease assembly in spite of the inactivation of the nik transport system. We tested the urease activity of the different strains grown in the presence or absence of 0.5 mM NiCl2 in the culture medium. The results in Figure 2B indicate that the urease activity of all the mutants reverted to normal values when the culture medium was supplemented with nickel, thus confirming the suspected role of the products of the nik genes of the ure2 operon in nickel transport. These results are also a further evidence for the extension of the operon until the nikO gene; that is a polar ureT mutation has a lower urease activity than the corresponding non-polar mutant, and identical activity to that of the nikO mutant, suggesting that the observed phenotype is the result of a polar effect on the genes downstream of ureT. Brucella urease assayed in vitro shows a pH-dependent activity that is maximal at pH 7.3 . When urease activity was assayed in intact B. abortus 2308 cells, the activity was higher at low pH values and dropped to near one third as the pH of the medium reached a value of 6 (Figure 3). ΔureT intact cells showed very similar activity to wild type cells at pH values above 6, but they lost the acid-dependent induction of urease activity at lower pH values. The increased urease activity of the ΔureT mutant due to enhanced urea uptake at low pH could be restored by complementation with the ureT containing plasmid pFJS243. pH dependency of urease activity in intact Brucella cells. Intact cells were exposed to the indicated pH for 15 minutes, in buffer containing 5 mM urea and then urease activity determined, and expressed in pmol of NH3 min-1 log10 cfu-1 (diamond) 2308, (white square) 2308 ΔureT, (black square) 2308 ΔureT (pFJS243). As the observed results were consistent with UreT being a urea transporter, 2308, 2308 ΔureT, and 2308 ΔureT (pFJS243) were exposed for one hour to increasing concentrations of urea (pH 4.2). The urease activity of both the wild type and the complemented strains increased steadily with the available urea. 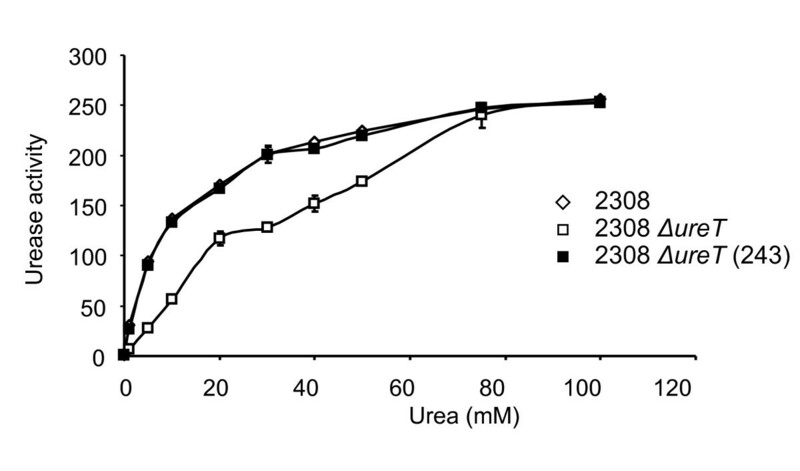 However, the ΔureT mutant showed significantly lower activities at all the urea concentrations tested, except for 75 and 100 mM, where urease activity reached wild type levels (Figure 4), presumably because membrane diffussion surpasses carrier mediated transport at these urea concentrations. Urease activity in a urea gradient. Intact cells exposed to buffer pH 4.2 with increasing amounts of urea. (diamond) 2308, (white square) 2308 ΔureT, (black square) 2308 ΔureT (pFJS243). It has been shown that under long (15 min) exposures to highly acidic environments (pH 2.0), urease activity in the presence of urea in the medium enables Brucella survival [1, 2]. The ΔureT mutant showed a susceptibility to acid significantly higher than the wild type but lower than the ΔureTp and nikO mutants at low concentrations of urea (5-10 mM). At 50 mM urea the ΔureT mutant was as resistant as the parental strain, while the ΔureTp and nikO mutants remained significantly susceptible (Figure 5). Survival of B. abortus urease mutants to acid exposure. Log n° of bacteria surviving an acid shock of 30 minutes at pH 2.0 in the presence of different amounts of urea. The arithmetic media from three separate experiments was plotted with standard deviations. An unpaired t-test was performed to determine if survival of each strain was significantly different than the corresponding wild type control. * indicates p < 0.05, ** p < 0.01. The susceptibility to low pH of the mutant nikO was completely reversed by complementing it with pFJS245 in trans. The mutant ΔureTp could not be complemented in this assay with either pFJS243 or pFJS245 (data not shown). However the acid sensitivity of both mutants could be compensated by the addition of NiCl2 to the growth medium (data not shown). The presence of two operons encoding urease in the genome of Brucella had already been reported. Evidence from our laboratory and elsewhere [1, 2, 9] showed that only urease from ure1 contributed towards the urease activity of Brucella. Explanations based on a degeneration in the sequence of ure2 were ruled out and early evidence suggested that ure2 genes were transcribed [1, 2]. Accordingly, we suggested that ure2 should have some function that ensures its conservation in the genome of Brucella . In this work, we analyzed the transcription of the ure2 operon by RT-PCR, confirming that the ure2 genes are transcribed and that transcription goes beyond ureT, up to the gene nikO (BAB1_1388) (Figure 1). While our RT-PCR experiment did not show a full-length transcript, it demonstrated the existence of messenger RNA molecules containing both ureT and ureD and also ureT and nikM. Furthermore, the introduction of a polar mutation in ureT had different effects than the introduction of a non polar mutation in the same gene, and the polar effects could be explained by the absence of activity of distal nik genes. Pooling this data, the most plausible explanation is that all the genes in the revised ure2 cluster form a single transcriptional unit that we have termed ure2ACBEFGDTnikKMLQO. We cannot rule out the possibility of secondary promoters existing in this region. By compairing the mutant strains to the wild type progenitor we observed that there was no significant difference in urease activity between protein extracts from B. abortus 2308 and the ΔureT mutant, but the analysis of urease activity in intact cells at different pH's revealed that, while the wild type strain showed a sharp increase in urease activity at pH values lower than 5.8, the activity of the ΔureT mutant remained unchanged. The amount of active urease in protein extracts from the ΔureT mutant was the same as that of the 2308 parental strain, indicating that urease biosynthesis was not affected. However UreT contributes towards urease activity in intact cells by facilitating the access of urea to the cytoplasm. Our results indicate that the urea transporter plays a role at low urea concentrations, equivalent to those encountered in host tissues. 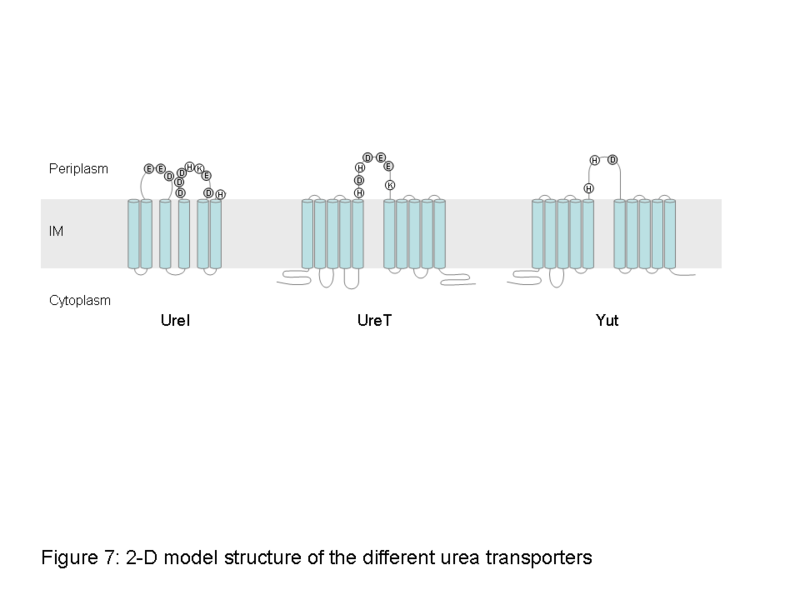 At higher concentrations, urea diffusion through the inner membrane probably compensates for the absence of the transporter. Remarkably, the activity of the transporter (measured as urease activity in this case) was pH-dependent. The activity observed at pH 5.8 or higher would be the result of urea diffusing through the inner membrane. That UreT is an acid-activated urea transporter is somewhat surprising, given that its closest homolog, Yut of Y. enterocolitica, is not pH-regulated , while the best known example of a proton-gated urea channel, UreI of the gastric pathogen H. pylori , shares a rather low amino acid sequence identity to UreT. The mechanism of proton-gating has been proposed to be a conformational change in the membrane domains of UreI induced by a change in the state of protonation of some residues (histidines or carboxylates) in the periplasmic loops. Modelling of UreT, UreI and Yut with TMRPres2D  revealed some differences between the protein sequences at the periplasmic loops. While UreI presents a total of fourteen protonable residues, Yut has only three, and UreT possesses seven (data not shown). The higher number of protonable residues of UreT could account for the differences found in acid activation between Yut and UreT. However, the mechanism of urea selectivity is probably the same, as a comparison with the crystal structure of the urea transporter of D. vulgaris shows that all the residues that form the pore are conserved (data not shown). The only one minor difference is that in one of the two urea slots present in UreT, one of the phenylalanines forming the slot is changed to leucine (L201F), and the corresponding leucine in the slot is changed to phenylalanine (F304L) (data not shown). Since urea uptake is not pH regulated in Yersinia spp, the unrestricted entry of urea would alkalinize the cytoplasm to lethal levels. Yersinia has solved this problem by expressing a urease with an acidic pH-optimum, that has little or no activity at ~pH 8.0 . Brucella urease has a pH optimum of 7.3, and although its activity is much lower at pH 8.0, it is still significant. In this case, the problem of lethal alkalinization is prevented by the existence of a pH-regulated urea transporter that reduces urea uptake to just the amount that diffuses through the inner membrane. In contrast to the ΔureT mutant, mutants ΔureTp and ΔnikO showed around a 40% decrease in urease activity in cell extracts. Both phenotypes were reversed by complementation of the mutant strains with a nikO-containing plasmid or, alternatively, with high concentrations of nickel in the culture medium suggesting that the amount of active urease in these mutants was limited by nickel availability. Complementation of the urease activity of the ΔureTp mutant with the nikO plasmid was rather surprising if we consider that the mutant should be defective not only in nikO but also in the other nik genes. Furthermore, the susceptibity to low pH of the ΔureTp mutant was not complemented by the nikO gene in trans, suggesting that other factors may be implicated in the acid resistance phenotype of Brucella. NikO is predicted to be the ATPase component of an ECF-type nickel transporter, and its mutation should abolish most of the activity of the transporter. There is another nickel transport system already described in B. suis, NikABCDE (10). nikA mutants were not affected in urease activity unless a chelating agent was added to the medium. As both the ΔureTp and ΔnikO mutants show lower urease activity than the wild type when grown in standard medium, we concluded that NikKMLQO is the main nickel transport system in Brucella. B. suis nikA mutants have an intact NikKMLQO nickel transporter, whose function can override the nikA mutation. In B. abortus 2308 by contrast, the single nikO mutation produced a significant decrease in urease activity. Sequence analysis reveals that the three B. abortus strains sequenced so far are natural nikA mutants, explaining why the nikO mutation caused such a decrease in urease activity. When supplemented with 500 mM NiCl2, B. abortus 2308 showed an increased urease activity, which probably reflects that the nickel content is not optimal in B. abortus and that this could be one of the factors that determines a lower urease activity in B. abortus when compared to B. suis. Brucella possesses several genetic resources to cope with its needs of urease. At least three loci, nik, ure1 and ure2 play a role in this function. There are also some additional genes, like cobT, that contribute in a yet unknown way to the overall urease activity . As a conclusion, Brucella spp. not only has at least one active urease, but also a specific, proton-gated urea transporter, and two nickel transport systems that contribute to the overall urease activity. While the urease structural genes and nickel transport systems affect the intrinsic urease activity, UreT would not affect it, but would be important for physiological processes such as the resistance to low acid conditions by increasing the efflux of urea into the bacteria, affecting in this way the overall urease activity, specially at low urea concentrations. These are the conditions faced by the bacteria in the gastrointestinal route, that it is been again recognized in the last years as an important route of infection in Brucella [1, 2, 23, 24], reinforcing the idea that urease activity, and the acid resistance that it causes, is important in the life cycle of the bacteria. The bacterial strains and plasmids used in this study are listed in Table 2. B. abortus strains were grown in Brucella broth (BB) or Brucella agar (BA) plates (Pronadisa, Spain). Escherichia coli strains were grown in Luria-Bertani broth (LB) or plates (LA). When required, media were supplemented with the following antibiotics: kanamycin (Km) 50 μg/ml, ampicillin (Ap) 100 μg/ml, or chloramphenicol (Cm) 25 μg/ml, or with 500 μM of NiCl2. Mating mixtures were plated in BA plates made selective with Brucella Selectavial, (BAF) (MAST Diagnostics, UK). All experiments with live Brucella were performed in a Biosafety Level 3 facility at the Department of Molecular Biology of the University of Cantabria. DNA manipulations were performed according to standard techniques . Restriction enzymes were purchased from Fermentas, and primers were purchased from Sigma-Aldrich. DNA fragments were amplified by PCR from B. abortus 2308 genomic DNA extracted as previously described . High-fidelity PCR was performed using Vent polymerase (New England Biolabs), and standard PCR was performed using Taq (Qiagen). PCR products were purified using GenElute™ PCR Clean-Up (Sigma). Amplified products were cloned in pGEM®-T Easy (Promega) or pJET1.2 (Fermentas) depending on the polymerase used. The DNA sequence of the final plasmids was determined to rule out mutations introduced by PCR. Gateway cloning was made according to the manufacturer instructions (Invitrogen). The oligonucleotides used are listed in Table 1. Plasmid pFJS235 carrying the aminoglycoside 3'-phosphotransferase gene (which encodes for kanamycin resistance) devoid of its transcription terminator (aphT) was constructed as follows. Primer aphT.F, derived from pUC4K  and located 5' from the aph gene, and primer aphT.R, derived from the aph sequence , were used to amplify a 1,005 bp DNA fragment from plasmid pUC4K. The amplified fragment was digested with Pst I and cloned into pUC4K/Pst I, yielding plasmid pFJS235. The aphT gene can be retrieved from pFJS235 by using Pst I, Hin cII, Sal I, or Eco RI. To construct a polar ΔureT mutant (ΔureTp) from B. abortus strain 2308, ureT was replaced by aph. DNA fragments both upstream and downstream of ureT were amplified with the following set of primers: U_BMEI0642_Xba I.F and U_BMEI0642_Bam HI.R were used to amplify a region of 578 bp upstream of ureT (U_ureT) and D_BMEI0642_Bgl II.F and D_BMEI0642_Pst I.R were used to amplify a region of 589 downstream of ureT (D_ureT). PCR fragments of the expected size were gel-purified and cloned into pGEM®-T Easy resulting in plasmids pFJS225 and pFJS226 respectively. pFJS225 was linearized with Bam HI and pFJS226 with Bgl II, and ligated to a 1.2 kb Bam HI fragment from pUC4K, containing aph with its transcription terminator. An Xba I &Pst I fragment of 1.4 kb was obtained directly from the partially digested ligation mixture, and cloned into pDS132 digested with Pst I and partially with Xba I, to obtain pFJS227b, that was used to construct the corresponding ΔureTp mutants in Brucella, as described below. For the construction of a non-polar ΔureT mutant from B. abortus 2308, two PCR fragments of 578 bp and 619 bp were generated immediately upstream and downstream of the ureT gene with oligonucleotides U_BMEI0642_Xba I.F and U_BMEI0642_Bam HI.R and oligonucleotides D_BMEI0642.F and D_BMEI0642_Pst I.R respectively. The reaction conditions for both PCRs were 30 cycles at 55°C, and 45 seconds at 72°C, using Vent polymerase. Both fragments (containing complementary regions) were ligated by overlapping PCR using oligonucleotides U_BMEI0642_Xba I.F and D_BMEI0642_Pst I.R and Taq polymerase from Qiagen, for 25 cycles at 55°C and extension time of 1 minute at 72°C. The resulting fragment containing the ureT deletion allele was gel-purified and cloned into pGEM®-T Easy to obtain pFJS236. A Bam HI fragment from pFJS235 containing aphT was introduced into the Bam HI site of pFJS236, resulting in plasmid pFJS238. An Xba I & PstI fragment from this plasmid containing the replaced ureT gene was cloned into pDS132 digested with Pst I and partially with Xba I, resulting in plasmid pFJS241b, that was used to create the corresponding Brucella mutant as described below. For the construction of a ΔnikO non-polar mutant, two PCR fragments of 501 bp and 499 bp were generated immediately upstream and downstream of the nikO gene with oligonucleotides BAB1_1388_Xba I.F and RT_BAB1_1388.R, and oligonucleotides BAB1_1388_Bgl II.F and BAB1_1388_Pst I.R respectively, using Vent polymerase. Both fragments (containing complementary regions) were ligated by overlapping PCR using oligonucleotides BAB1_1388_Xba I.F and BAB1_1388_Pst I.R and Taq polymerase, and the resulting fragment containing the deleted nikO allele was cloned into pGEM®-T Easy (pFJS237). A Bam HI fragment from pFJS235 containing aphT was introduced into the Bgl II site of pFJS237, resulting in plasmid pFJS239. An Xba I &Pst I fragment from this plasmid containing the replaced nikO gene was cloned into pDS132 digested with Pst I and partially with Xba I, resulting in plasmid pFJS242b, that was used to create the corresponding Brucella mutant as described below. To construct the different mutants, replacement plasmids were transformed into E. coli S17-1 λ pir, and mobilized to the corresponding Brucella recipient strain, by mixing equal volumes (100 μl) of liquid cultures of both donor and recipient cells on a 0.22-μm-pore-size filter. The filter was left for 4 h on a BA plate without antibiotics, soaked in PBS, and then different dilutions were plated onto BAF plates containing Cm and Km. Colonies growing in this medium represented single-crossover events. Five colonies of each construct were pooled and grown in BB, and 108 CFU were plated on BA containing 5% sucrose to select for the double crossover. Sucrose-resistant colonies were replicated in BA Cm plates, and CmS colonies were selected and analyzed by PCR and southern blot to ensure that the right mutant had been constructed. To complement the different mutants complementation plasmids were constructed as follows: ureT was cloned by using the Gateway recombination cloning technology (Invitrogen) . The entry vector was obtained from the Brucella ORFeome generated previously . The destination vector, pRH016 , carries a chloramphenicol resistance marker, and the toxic cassette is flanked by attR1 and attR2 recombinational sites. The recombinational cloning procedure was performed as recommended by the manufacturer, to produce pFJS243. nikO was amplified by PCR with oligonucleotides nikO _Sal I.F and nikO _Pst I.R, cloned into pGEM®-T Easy to obtain pFJS244, and then subcloned into pBBR1 MCS/Sal I &Pst I to give pFJS245. Both pFJS243 and pFJS245 were transformed into E. coli S17-1 λ pir to be mobilized to Brucella. Complemented strains were selected in BAF Cm. B. abortus strains were grown in BB until the end of the exponential phase, washed in sterile water and resuspended at a concentration of 108 CFU/ml in citrate buffer pH 2.0 for 30 min in the presence or absence of different concentrations of urea. Bacteria were washed three times in phosphate-buffered saline (PBS), and survivors counted after dilution and plating. Urease activity was determined by measuring the amount of ammonia released from urea. Exponential cultures of bacteria grown in BB, supplemented or not with 500 μM of NiCl2 as indicated, were recovered by centrifugation, washed, and resuspended in PBS to a concentration of 108 CFU/ml. The preparations were then lysed using three 10-s cycles with a FastPrep system (Bio 101, Vista, CA) at the maximum setting, cooled on ice, and centrifuged for 5 min at 25,000 × g at 4°C to remove the cell debris. Crude extracts were stored at -80°C until they were used. For standard urease reactions, 5 to 10 μl of extract were added to a tube containing 200 μl of 50 mM urea in PBS and incubated for 5 min at 37°C. Urease activitiy was also measured in intact cells, in this case the pelleted bacteria were resuspended in 200 μl of either PBS (pH 7.7) or citrate buffer at different pH (3.8, 4.2, 4.6, 5.0, 5.4, 5.8, and 6.2), supplemented or not with urea at different concentrations (0, 1, 5, 10, 20, 30, 40, 50, 75, and 100 mM), and incubated at 37°C for 1 hour. The amount of ammonia released from urea hydrolysis was determined colorimetrically by the modified Berthelot reaction , and the total protein concentration was measured by a Bradford assay . Urease specific activity was expressed in μmol of NH3 min-1mg-1 protein (for crude extracts) and pmol of NH3 min-1 log10 cfu-1 (for intact cells). 3 ml of a bacterial culture in mid-log phase (OD600 = 0.6-0.7) were stabilized with RNAprotect Bacteria Reagent (Qiagen). After harvesting the cells, they were resuspended in 300 μl of TE containing lysozyme 1 mg/ml, and incubated for 15 min at room temperature. They were treated with 15 μl of 10% Zwittergent 3-16 (Calbiochem) and 6 μl of 20 mg/ml of proteinase K for 1 h at 37°C, and then total RNA was extracted with the RNeasy Mini System (Qiagen) in combination with the RNase-Free DNase Set (Qiagen). cDNA was generated by using Superscript III RT (Invitrogen) according to the manufacturer's protocol. 1 μl of the resulting cDNA was used for each PCR. As a negative control, reactions were also run on RNA templates without RT treatment, and as a positive control, each reaction was also made with purified genomic DNA as template. The cycling parameters were 30 cycles of 94°C for 30 s, 55°C for 30 s, and 72°C for 1.5 min. The resulting amplicons were analyzed in 0.8% agarose gels. Primers were designed with Primer3 software . The complete genome sequence and annotation of the B. abortus 2308 strain was obtained fron GenBank (Accession numbers AM040264 and AM040265 for chromosomes I and II respectively). Blast comparisons against the microbial genome database were performed via web at the NCBI Blast server . A statistical analysis was performed using Prism3, version 3.0(GraphPad Software, San Diego, CA). Statistical significance wascalculated using either a nonparametric Mann-Whitney test or an unpaired t test. A P value of < 0.05 was considered statistically significant. This work was supported by grants BIO2007-63656 from the Spanish Ministerio de Educación y Ciencia, and API 07/01 from Fundación Marqués de Valdecilla to FJS. We thank Matxalen Llosa and Olga Draper for critical reading and copyediting of the manuscript, Regis Hallez and Xavier de Bolle for providing plasmid pRH016, and Dominique Schneider for providing plasmid pDS132. FJS designed and supervised the work and wrote the paper. AC performed all the microbiological work and the different urease activity assays. AS did the transcriptional analysis of the urease operon. JMGL performed the genomic analysis and bioinformatic work and also wrote the paper.